Comic Con revolution is an annual comic con held at the Ontario Convention Center. The third annual event is scheduled for May 18th & 19th, 2019. The hours of the event are 10:00am (9:00a w/ advance ticket purchase) to 7:00pm on Saturday May 18th and 11:00am (10:00a w/ advance ticket purchase) to 5:00pm on Sunday May 19th. Attendees can expect a full exhibit hall with over 300 exhibitors including comic creators (over 160 creators in Artist Alley), new comic dealers, vintage comic dealers, Comic publishers, toy & collectibles vendors, crafts, costumes, clothing, cosplayers, fan groups, media stars and more. Getting your Comic Con Revolution tickets is quick, easy and convenient. To purchase your tickets online just click here. Tickets are also available locally at some of your favorite comic shops. Comic Con Revolution is a safe place for all. This means we expect it to be a safe environment for fans from any ethnicity, creed, religious background, political background, gender, gender identity, sexual identity, sexual orientation, fandom, etc. Comic Con Revolution has a zero tolerance policy for harassment of any kind. This includes, but is not limited to: physical assault, verbal harassment, sexual harassment, stalking, unwanted physical contact, unwanted advances, or inappropriate photography. Those found in violation will be removed from the event. If you feel you are the victim of or have witnessed harassment of any kind please report your concerns to Comic Con Revolution staff at the information booth in the lobby of the convention center. Comic Con Revolution encourages the use of props complete your cosplay. Those props must be inspected and approved before entering the event as no functional props or prop weapons are allowed at Comic Con Revolution. Here are some basic guidelines to keep in mind. Projectile costume props and weapons must not be able to operate. Costume swords must not be metal or have a sharp edge. After your costume props have been reviewed, they will be tagged by security to designate that your props have been checked and approved. Comic Con Revolution employs on-staff professional photographers & videographers. By entering and by your presence at Comic Con Revolution, you consent to be photographed, filmed and/or otherwise recorded. Your entry constitutes your consent to such photography, filming and/or recording and to any use, in any and all media throughout the universe in perpetuity, of your appearance, voice and name for any purpose whatsoever in connection with the production presently entitled: Comic Con Revolution. You understand that all photography, filming and/or recording will be done in reliance on this consent given by you by entering Comic Con Revolution. If you do not agree to the foregoing, please do not attend Comic Con Revolution. The Ontario Convention Center is a breathtaking venue, frequently used by filmmakers as an onsite location for movies and commercials. Contemporary in design and equipped with the latest in technology, it boasts more than 225,000 square feet of flexible exhibit, meeting and function space and is ideal for conventions, trade shows, exhibits and meetings. The Convention Center provides a full range of technology services, including Wi-Fi, Internet, DS3 and video-conferencing capabilities. 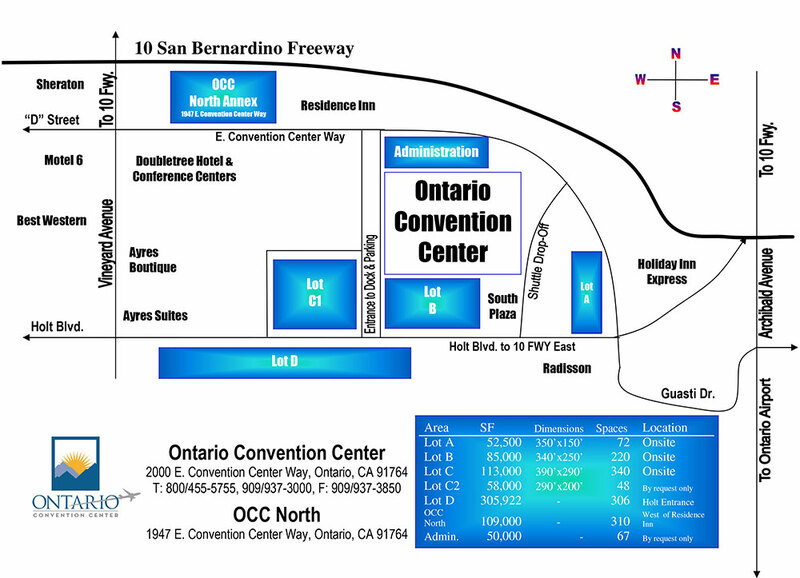 Slight left onto San Bernardino Fwy 10 E.
For more local parking options click here. Unfortunately we do not accept volunteers at Comic Con Con Revolution. We do very much appreciate the interest in offering your time as a volunteer; however, we only hire paid staff both pre-show and on-site. If you have any special needs or disabilities you would like to let us know about in order to make your experience the bext it can be please a contact us no later than two weeks before Comic Con Revolution so we can be prepared. The information contained on this website has been prepared for general information only. It is made available in good faith by The Comic Con Revolution (CCR), owned and operated by Atomic Crush Events, LLC (ACE). All information has been derived from sources to be reliable and accurate. All information, including all information regarding attendance of guests and exhibitors are subject to change at any time. CCR and ACE does not give any warranty as to the accuracy, reliability, or completeness of the information and accepts no responsibility for updating or correcting any part of the information. CCR and ACE and its directors, officers, employees and consultants do not accept any liability (whether arising in contract, or tort, or negligence or otherwise) for any error, omission or misrepresentation in relation to the information or for any loss, damage, cost or expense (whether direct, indirect, consequential or otherwise) incurred by any person whatsoever arising out of or referable to the information on this website or accessed through this website.